It's hard to believe that professionals of a certain caliber still don't know how to conduct themselves in meetings, via email and at events. There are still many people being fed outdated information on navigating their career, and truly believe they are following the best advice. Times have changed in the working world, but there are still some rules that remain the same. This also applies to the way people are networking these days. With social media being a key component for businesses and freelancers, it’s being leveraged for business development. Not to mention, 85% of jobs are filled by networking. In a social-media driven world, there also seems to be an emphasis on the importance of face-to-face meetings. In fact, 68% of entry-level professionals favor face-to-face interactions over online and 41& of those who network, would like to get out there more often. Giving someone your business card who didn't ask to stay in touch with you, is just like guys who assume you want their number. Don't be like those guys. If someone wants to stay in touch with you, they will add you on LinkedIn or other social media platforms. Actually, these days that's what you can expect most when attending networking events and conferences. Most people won't take your card but instead find you later on social media and stay in touch that way. No need carry around tons of business card anymore, a few will do. Another big no no, is taking someone's information and adding them to your email list. No one should be on your email list who didn't sign up themselves. It's hard to believe but some people take any interaction you have with them online or in person, as an OK to get constant updates from them. This is the quickest to get kicked out of someone's network on LinkedIn or leave a bad first impression. If someone trusted you with their contact info, don't misuse it. 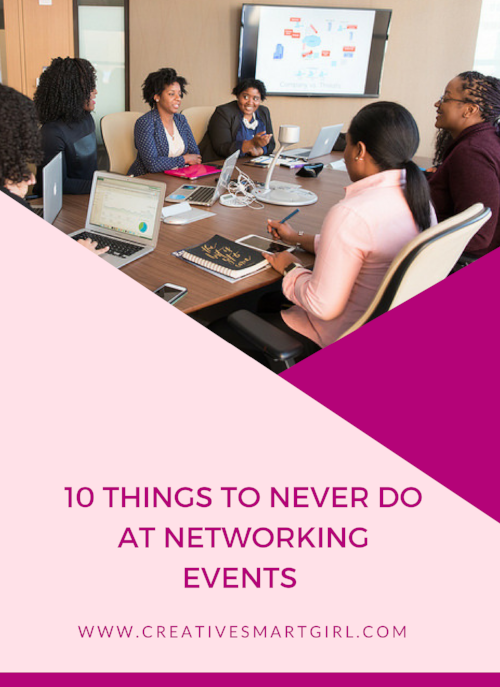 Nine times out of ten, the people you talk to at networking events you are meeting for the very first time. People tend not to be comfortable risking their reputations trying to get someone they don't know hired. Stay away from telling people you are job hunting and instead use phrases like "I'm transitioning from X position to Y position." Focus on making the right impression and you won't have to ask anyone to put in a good word for you. Is there anything worse than someone who only talks about themselves in a conversation? Always ask more questions about someone else than you talk about yourself. It will mean a lot to someone you want to connect with, if you take an interest in their life and career. Do we even need to get into this? People who are your friends, mentors and managers will have no problem letting you pick their brain. But people you barely know? Not so much. Even if you are young and just breaking into your industry, understand that you need to respect the time of those more experienced than you. If you aren't able to pay someone's hourly rate, try building a relationship first. If you are only attending networking events to be a social climber, stay at home. It's rude and intrusive to ask someone if they can introduce you to a higher up or even if they're acquaintances with someone you'd like to connect with. Most people are natural connectors and will make the introduction on their own for you to meet someone in their network. It's standard to have no more than two drinks when at industry events. You never want to embarrass yourself, organization or the event planners by being intoxicated at a professional event. The fact is, you won't be able to get to everyone in one day and that's OK. If you have access to a guest list, you can make your own "hit list" of everyone you'd like to speak to before the event is over. This way, you can focus on having a handful of meaningful conversations, instead of constantly looking for the next attendee to speak with. If you happen to find someone who is willing to help you get a foot in the door, don't hand them your resume unless they ask for it. If someone wants to see what you've done, they'll ask for you to email your resume and portfolio after the event. Focus on building relationships before asking for favors. You never know who knows who. You could be speaking to someone who is just their to support their friend - the person who helped organize the event - while you bash it. Event planners work hard to make nice experiences for you, be gracious and thank them. What are some of your networking rules?